This value set of 5 pink painted wood hangers is sized to fit 18-inch doll clothes. The hangers measure 3 inches high and 6.25 inches wide. These hangers are designed to fit most 18-inch doll wardrobes, closets and armoires, including all Emily Rose Doll Clothes products. 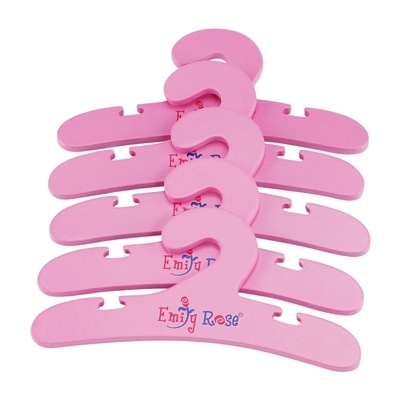 Set of 5 pink painted wooden clothes hangers, with notches, includes Emily Rose signature logo. Doll, doll clothes and doll closet are not included.